Kuka Robotics showcased its MyArc Package and KR 210 R2700 at the Fisita 2012 World Automotive Congress & Exhibition, held in Beijing, China from November 27-30. Kuka MyArc Package is an Arc Welding Package which include robot KR 5 arc AWP, a new control system for Kuka robot KR C4, an arc welding database Kuka.ArcTech, MyArc Bas 350/MyArc Pro 350 Power Source and MyArc T350 welding gun. 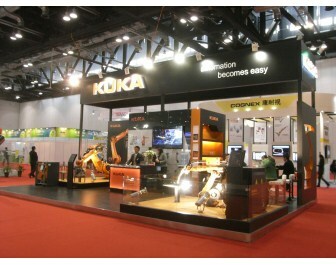 Arc welding simulation application was shown with KR 5 arc AWP. It belongs to the category of KR 5 arc robots, is a versatile and dynamic lightweight robot with six axes and 37kg maximum total load capacity. Its payload of 5kg makes it suited to standard arc welding tasks. Kuka says the robot takes up little space and can be integrated into virtually any cell concept. Whether mounted on the floor or inverted on the ceiling, KR 5 arc AWP boasts a working envelope of over 1,400mm. Meanwhile, the KR 201 R2700 was seen in application of automotive machine parts handling. As a six axis high payload robot, it is one of the all-rounders of the KR Quantec extra series. Featuring with the payload capacity of 210kg and supplementary payload of 50kg, as well as a reach of 2,700mm, the robot is suitable for spot welding, handling and loading/unloading industries with its advantages of long working envelop and high flexibility. Comparing with other robots, KR 210 R2700 extra is more streamlined, more compact and more robust in the popular 210kg/2,700mm category, according to Kuka. It also sets new standards in precision, performance, energy efficiency and availability by reducing the moving mass.